Cowhide; flat, round toeline, solid colour, leather lining, no appliqués, buckle, leather sole. 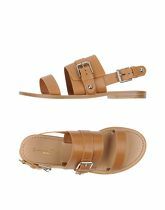 Soft Leather; flat, solid colour, suede effect, wrapping straps closure, leather, no appliqués, round toeline. 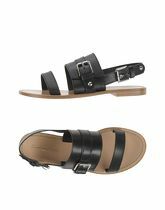 Cowhide; flat, buckle, no appliqués, round toeline, leather, solid colour, leather sole. Textile fibres; leather sole, round toeline, no appliqués, flat, satin, solid colour, leather lining. Soft Leather; leather sole, narrow toeline, no appliqués, flat, laminated effect, basic solid colour, leather lining. Soft Leather, Plastic; flat, narrow toeline, no appliqués, leather lining, varnished effect, solid colour, leather sole. 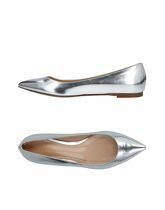 Heel height 3.71 inches; Soft Leather; leather lining, wrapping straps closure, no appliqués, round toeline, sueded effect, solid colour, spike heel. 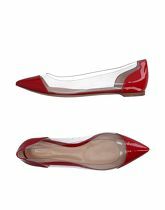 Heel height 3.9 inches; Soft Leather; stiletto heel, narrow toeline, no appliqués, leather lining, laminated effect, solid colour, leather sole. Heel height 4.1 inches; Soft Leather; leather sole, round toeline, buckle, spike heel, sueded effect, solid colour, leather lining. is an Italian producer to luxury footwear for women and men. Italian style, high quality natural materials and classic designs combined with absolutely stunning accessories and trimmings - this is what attracts sophisticated aficionados of Gianvito Rossi boutiques. Among traditional designs of ballerina shoes, pumps, women’s and men’s boots and high boots, Gianvito Rossi offers pumps in fabulous and sickly colors, furred high heels, sandals with straps imitating a spider web and, since 2010, also luxury sports shoes. 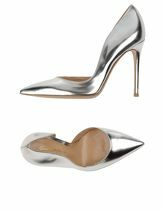 Gianvito Rossi shoes are undoubtedly as perfect choice for people who want to stand out from head to tie and at the same time opt for comfort and everlasting classic. On this site you will find women's shoes in sizes from 2 to 9. There are 317 pairs of shoes starting with price of £173,00; 40 pairs from the whole collection are discounted at this moment. The most frequent shoes in this category are Sandals, Court Shoes, Ankle Boots and Boots. There are 2650 brands, most of shoes comes from Office, New Look, Betty London, L' Autre Chose and Geox. The shoes are available in different colours, mostly in Black, Beige, Red, Pink and Blue.